Started pullets are for people who don't have the time, equipment or desire to care for chicks, or who are just too anxious for some fresh backyard eggs to wait for baby chicks to grow up! 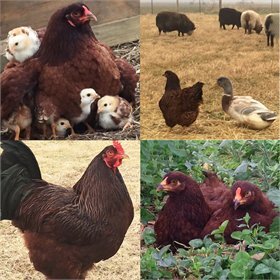 The Marans breed was developed originally developed in France in the mid 1800's in the town of Marans. (This is why the name of the breed always has the "S" at the end, whether singular or plural.) Marans became popular for their dark mahogany-brown eggs--a trait they are still known for today. The Black Copper variety of Marans have the capability of laying the darkest eggs of all the Marans we carry, so we're beyond happy to be able to offer you this breed. Their eggs are a deep, rich, chocolate brown. For those of you who adore hens that lay colorful eggs, this breed is a must-have! So much so, in fact, that they're among the rare varieties Martha Stewart had us deliver to her for 2016. So when you Oooooh and Ahhhh over photos of her flock's eggs, just know that it's likely the darkest were laid by the Marans (and Penedesencas) she got from My Pet Chicken! 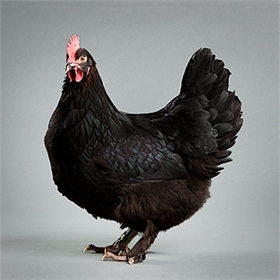 The beautiful Black Copper Marans are calm, quiet and gentle. These birds may have lightly feathered legs or bare legs. 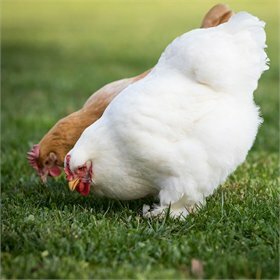 Read more about Marans. These pullets will be vaccinated for Marek's disease and will be 6 weeks old when shipped.